Canada always remains in news being the top immigration destination in the world. Its immigration news, updates and information often remains the point of discussion among the immigrants all over the world, through different social media platform, forums and groups, etc. most of these discussions are about Express Entry System- the premier immigration system of Canada. How Express Entry system works? The Express entry selects the applicants for Canadian permanent residency based on their scored points. This whole system is called Comprehensive Ranking System (CRS). Higher the CRS points better are your chances of getting selected by the IRCC (Immigration Refugees and Citizenship Canada) for Canadian permanent residency. The IRCC opens a draw every fortnight to select the applicants with top CRS score. For every draw, IRCC announce cut off marks or CRS score requirement. 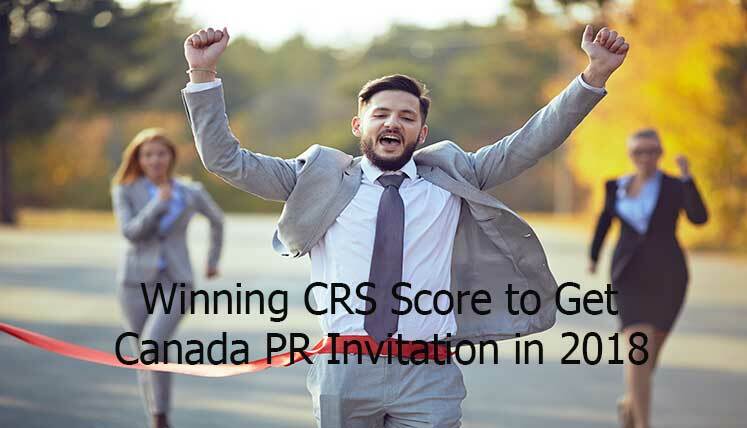 The applicants often remain confused as to what will be the CRS score requirement from IRCC in the upcoming draw of express entry and whether or not they will be able to get the ITA (Invitation to apply) Canada PR based on the same. Also read– How equipped you are to get Permanent Residency in Canada in 2018? What will be winning CRS score in 2018? Last year, IRCC made significant reduction in the CRS score requirement in the first half of the year 2017. In fact, it went down to its lowest mark, i.e. 413 CRS points in May 2017. However, this year the IRCC hasn’t reduced the qualifying marks to a great extent. 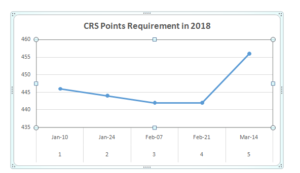 The qualifying marks or CRS score requirement this year is hovering around 445 mark. In fact, last draw saw an unexpected rise in the qualifying marks, as it raised to 456 points in the last Express entry draw launched on March 14, 2018. Looking at the current situation, if you have the CRS score around 456 marks, you stand a strong chance of obtaining Canadian permanent residency. However, a big-time question here is, is there any possibility of fall in the CRS score requirement from IRCC (Immigration Refugees and Citizenship Canada). Can we see a deduction in qualifying marks in next few EE draws? Well, looking at the massive annual immigration target (310,000) of Canada for the year 2018, we can expect the fall in the qualifying marks in the upcoming express entry draws in the year. Last year, the lowest CRS score requirement was413 CRS points. Well, its hard to predict, whether or not the IRCC will reduce the qualifying marks to this level, but one thing is confirmed that it is bound to reduce significantly in the coming draws of federal Express Entry System. If you aspire to get Canada PR visa in the year 2018 through express entry or PNP, etc., you may contact Visas Avenue certified Canadian Immigration expert by calling at Toll free an78-18-000-777. Alternatively, e-mail your queries to Visas Avenue e-mail id- info@visasavenue.com.